DESCRIPTION -- Original souvenir lapel pin from the vessel the Alfred Holt Shipping Line, which is in a very good condition and dates from the 1940â€™s/1950â€™s. HISTORY -- Alfred Holt and Company, trading as Blue Funnel Line, was a UK shipping company that was founded in 1866 and operated merchant ships for 122 years. It was one of the UK's larger shipowning and operating companies, and as such had a significant role in the country's overseas trade and in the First and Second World Wars. Alfred Holt founded the business on 16 January 1866. The main operating subsidiary was the Ocean Steam Ship Company, which owned and operated the majority of the company's vessels. 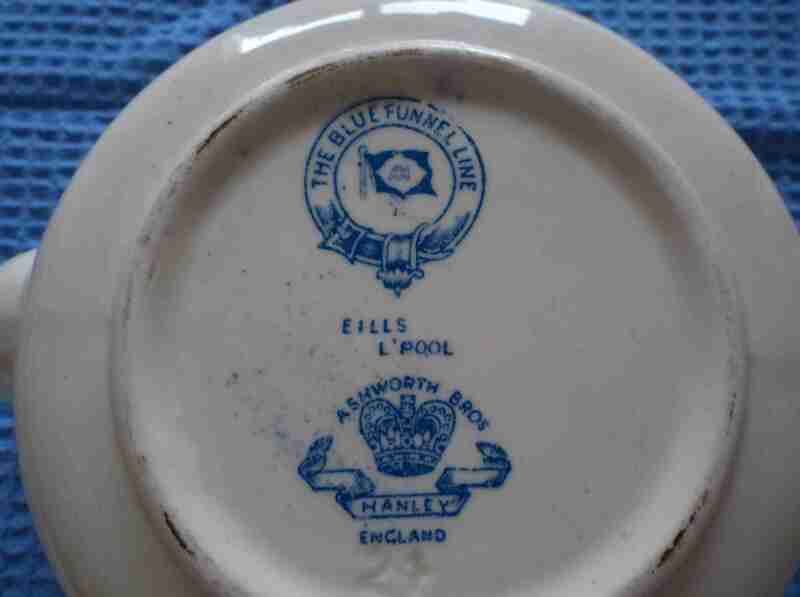 DESCRIPTION -- Fantastic item from the Blue Funnel line shipping company and is a teapot as used on board cruises. It is decorated in the company pattern and is bottom marked with the company name and houseflag. The item is in a good condition and a rare find (click on picture for a view of the bottom of item). HISTORY -- Alfred Holt and Company, trading as Blue Funnel Line, was a UK shipping company that was founded in 1866 and operated merchant ships for 122 years. It was one of the UK's larger shipowning and operating companies, and as such had a significant role in the country's overseas trade and in the First and Second World Wars. 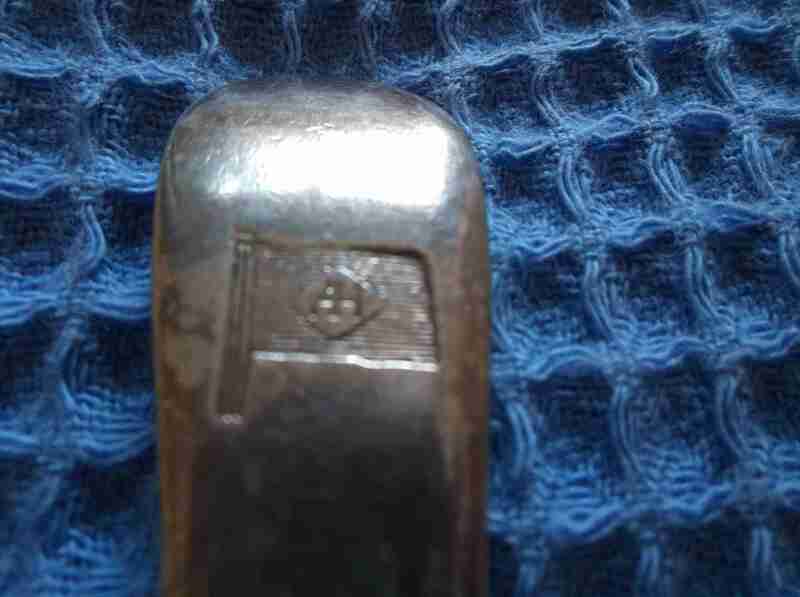 DESCRIPTION -- From the Blue Funnel Line shipping company this is an as used on board dining knife and fork and the items are in a very good condition and a rare find (click on the picture to see a close up of the emblem on the end). HISTORY -- Alfred and Philip Holt established the Blue Funnel Line in 1865 to run steamers, equipped with Alfred's own design of compound engines, from Liverpool to Asia. After initial difficulties the company achieved success when the Suez Canal was opened in 1869. The Suez reduced the long voyage and gave Blue Funnel steamships an advantage over their sailing contemporaries, to which the Suez Canal was not accessible. DESCRIPTION -- Early framed photograph of a Blue Funnell Line vessel the SS Pyrrhus and is in a very good condition. The photograph is taken from our collection of over 2000 shipping photographs with the size of the photograph being 10" (27cm) x 8" (22cm). 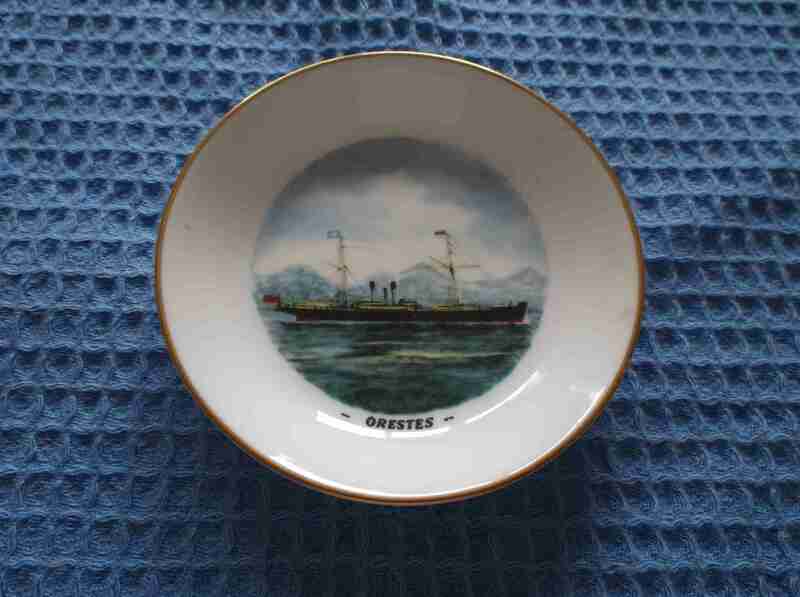 DESCRIPTION -- From the 1960's this is a souvenir china dish from the Blue Funnel Line shipping company and is a Royal Worcester dish from the vessel the Orestes and is in an excellent condition with the size being 4" (10cm). HISTORY -- To many, Alfred Holt's Blue Funnel Line was the finest shipping company of them all. It certainly did build fine ships, had noble traditions of service in war and peace, and set standards by which other companies were judged. But adulation needs to be tempered with realism, as the company had times of brilliant achievement and periods when it seemed to have lost the plot. 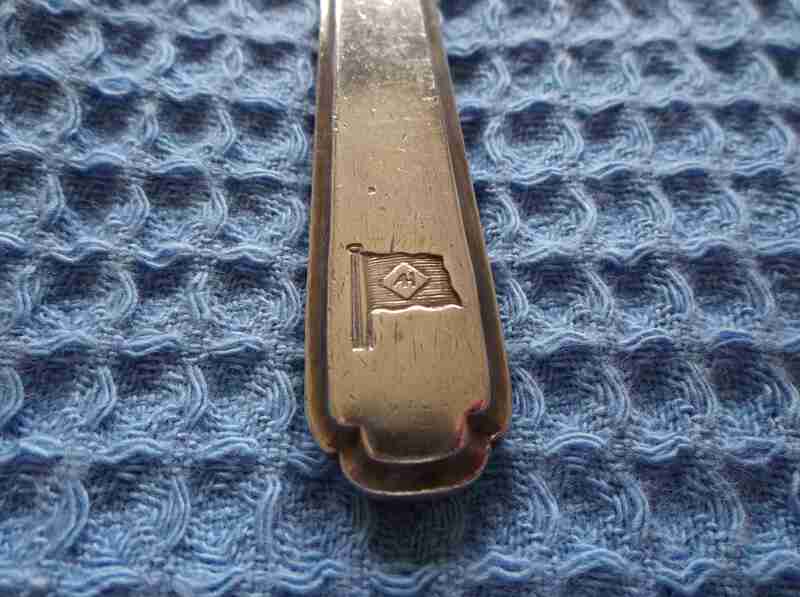 DESCRIPTION -- As used in service large size silver-plated serving spoon from the Blue Funnel Line shipping company which is in a very good condition. HISTORY -- Alfred Holt and Company, marketed as the Blue Funnel Line, was founded by Alfred Holt on 16 January 1866. The main operating subsidiary was the Ocean Steam Ship Company, which owned and operated the majority of the company's vessels. A Dutch subsidiary, the Nederlandsche It covers the various ships of the time from the fleet of the Blue Funnel Line shipping company. Stoomvaart Maatschappij Oceaan, was founded in 1891, as was the East India Ocean Steam Ship Company, operated from Singapore. 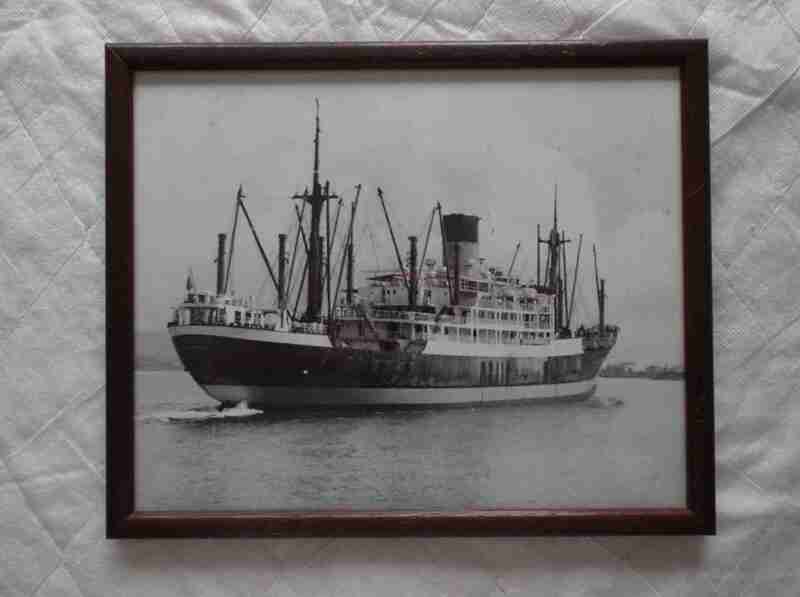 DESCRIPTION -- As new large size photograph of the Blue Funnel Line vessel the Memnon and shows the ship at sea. 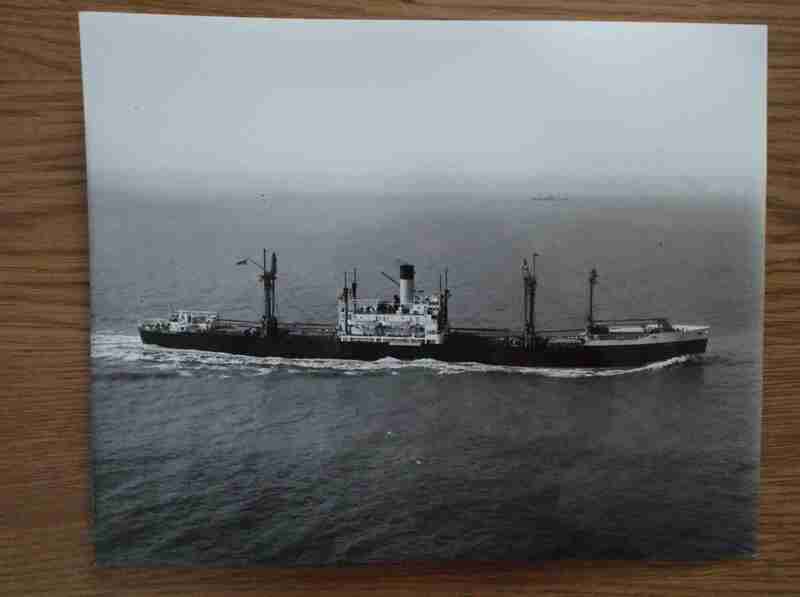 The photograph is taken from our collection of over 2000 shipping photographs and it is in a very good condition with the size of the photograph being 10" (25cm) x 8" (20cm).